Life's a Beach | Expat Life in Playa del Carmen : Drastic Price Reduction on Marina Front Penthouse! Reduced from $479,000 usd - Now just $390,000 usd !!! Puerto Aventuras Waterfront - Due to the financial downturn in the rest of the world, one of our clients has been forced to drastically discount their beautiful sea view penthouse unit at Marina Turquesa. This is a secure, upscale condo development now close to completion in the gated resort community of Puerto Aventuras. The exterior of this building is complete but this unit is still very easily customized to meet its new owner’s needs. This 2300 sqft multi-level penthouse will be finished with top quality materials including solid mahogany cabinetry, ticul (a lovely local stone), marble floors and baths and granite countertops. This unit offers an open floor-plan with a spacious living and dining area, large fully equipped kitchen, three bedrooms and baths and laundry room. Upstairs, via an interior staircase, the private rooftop terrace offers the perfect place to relax, read, lounge in the sun or dine. Complete with Jacuzzi and grilling area, there is plenty of space to create a fabulous outdoor room under the stars. 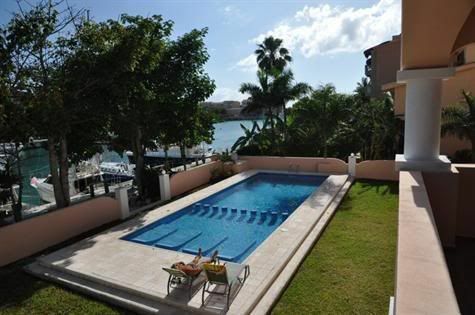 Enjoy gorgeous views over the pool and out to the crystal blue waters of the Caribbean. These ten beautiful condominiums are located on the first marina, a quick walk to the Omni Beach Club and just around the corner from one of the region’s best private schools, the world famous Dolphin Discovery , a world class marina, golf, tennis, shopping and all of the great local eateries. Please contact me ASAP if you would like to schedule a private showing or desire more information on this amazing deal.